Monitoring of commercial heat exchangers is done by tracking or evaluating the overall heat transfer coefficient. 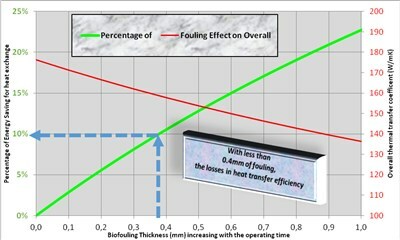 The overall heat transfer coefficient tends to decline over time due to fouling. By periodically calculating the overall heat transfer coefficient from exchanger flow rates and temperatures, the owner of the heat exchanger can estimate when cleaning the heat exchanger is economically attractive. Oftentimes during their use, heat exchangers collect a layer of fouling on the surface which, in addition to potentially contaminating a stream, reduces the effectiveness of heat exchangers. In a fouled heat exchanger the build-up on the walls creates an additional layer of materials that heat must flow through. Due to this new layer, there is additional resistance within the heat exchanger and thus the overall heat transfer coefficient of the exchanger is reduced. The red line shows the decreased overall coefficient without any cleaning method of the circuit: without cleaning, it takes only 0.4mm of fouling to decrease the heat transfer coefficient from 177 W/mK to 158 W/mK. In other terms (green line), keeping clean the heat exchanger (avoiding fouling formation) reduces the operating (energy) costs of around 10%, for 0.4mm thick fouling.